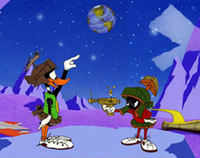 Duck Dodgers is the fictional star of a series of cartoons produced by Warner Bros. He is actually the famous (but still fictional) cartoon star Daffy Duck, cast in the role of an intergalactic future "hero". 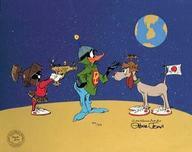 Duck Dodgers first appeared in the 1953 cartoon short Duck Dodgers in the 24th Century, directed by Chuck Jones. Jones created a spoof of the popular Buck Rogers in the 25th Century and Flash Gordon science fiction serials of the 1930s, casting the brash, egomaniacal Daffy Duck as the hero of the story. 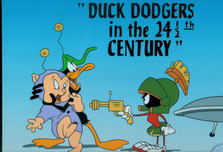 The cartoon, Duck Dodgers is widely praised as one of the greatest and funniest Warner Bros. cartoons of all time. 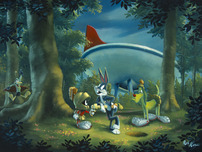 As of 2003 it is available in the DVD compilation Looney Tunes Golden Collection: Volume 1. Remember every time you purchase Duck Dodgers artwork over $995, shipping is FREE in the continental U.S. and there is NO SALES TAX when you purchase outside of Colorado. 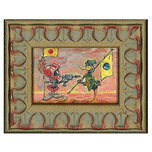 We SHIP WORLDWIDE and offer Layaway for Duck Dodgers art.